Announcing the Socata TBM 900! Today we're excited to announce a new developer to the commercial market! 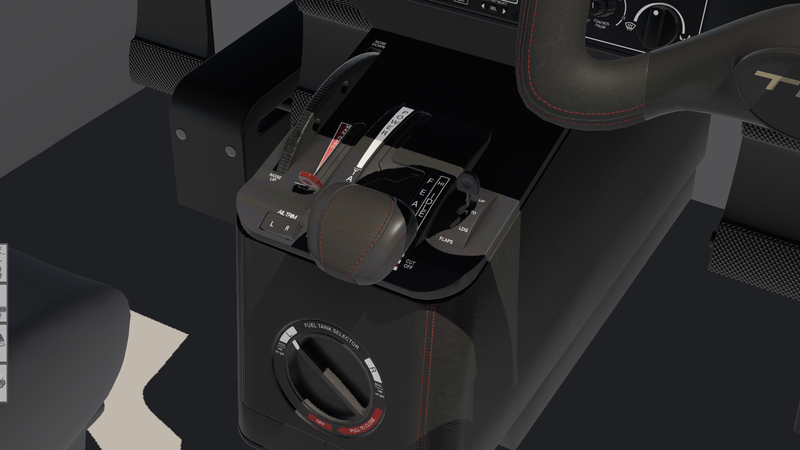 HotStart is the name, and the first product will be a very detailed Socata TBM 900. This particular product will also be jointly created with Goran Matovina of Leading Edge Simulations for the 3D modeling portion. The goal for release time as it stands is early summer of this year, so the wait won't be too long and we'll continually post updates here to ensure you can keep up to date. 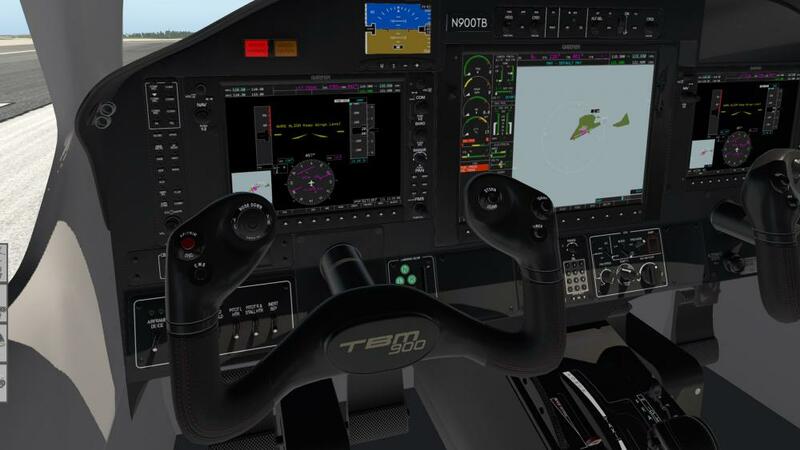 The HotStart TBM 900 will be a high-fidelity simulation of the TBM 900 high-performance single-engine turboprop aircraft. 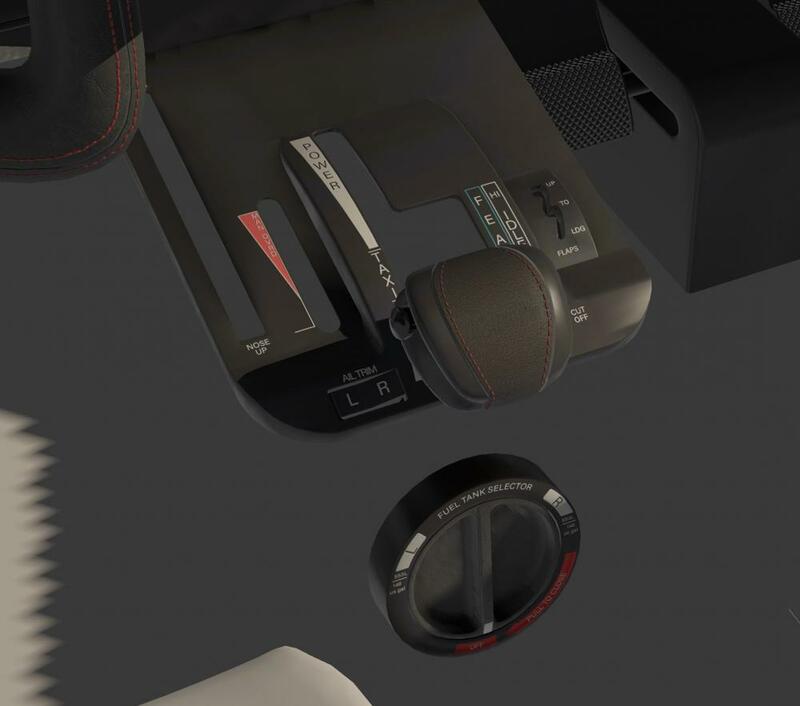 The model features a persistence system and wear & tear on all aircraft components to simulate the experience of owning and caring for the aircraft. All simulation state is fully persisted across reloads, so performing proper shutdown and cleanup after a flight is imperative. Heavily multi-threaded systems architecture to leverage performance of modern CPUs with many cores. Flight model tuned to perform to within a few percent of the real aircraft in the normal flight envelope, including maximum and stall speeds, rate of climb, fuel burn, trim behavior and control feel. Full aircraft state persistence. Every switch, flight control position, fuel state and on-airport position is restored upon reload. Even between reloads, system resources change in real time. The engine and oil cools down slowly between flights, the battery drains, tires slowly deflate, etc. Fine-grained systems model, down to individual sub-components. The always-on failure system realistically responds to wear & tear and overstress for each sub-component based on individual load factors. Over-torque, over-temp, frequent starts, hard landings, operating in FOD-contaminated environments and many more all affect individual sub-component wear & tear and service life. Sub-component wear realistically reflects on aircraft performance. Worn engine parts reduce maximum available power, worn prop reduces top speed, worn tires result in worse grip during ground ops, etc. Aircraft maintenance manager to inspect and repair or replace any damaged sub-component. The maintenance manager tracks per-airframe operating expenses in a realistic manner to show the real cost of operating the aircraft. 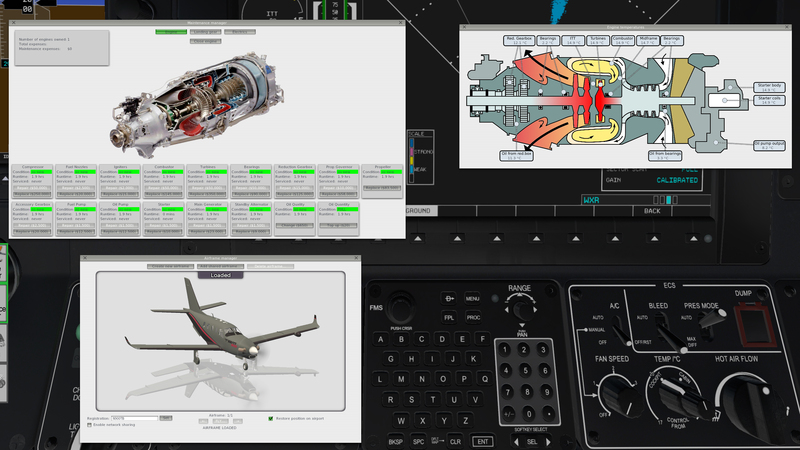 Airframe manager that allows you to operate multiple simulated airframes, each with their own independently tracked wear & tear, livery selections and custom registration marks applied. Airframes can be automatically synchronized between multiple machines over the network with just a few clicks. This automatically syncs up aircraft position, configuration and wear & tear to simulate multiple users sharing the same physical aircraft. See how your fellow pilots treated the aircraft by checking the maintenance manager and engine trend monitoring outputs. 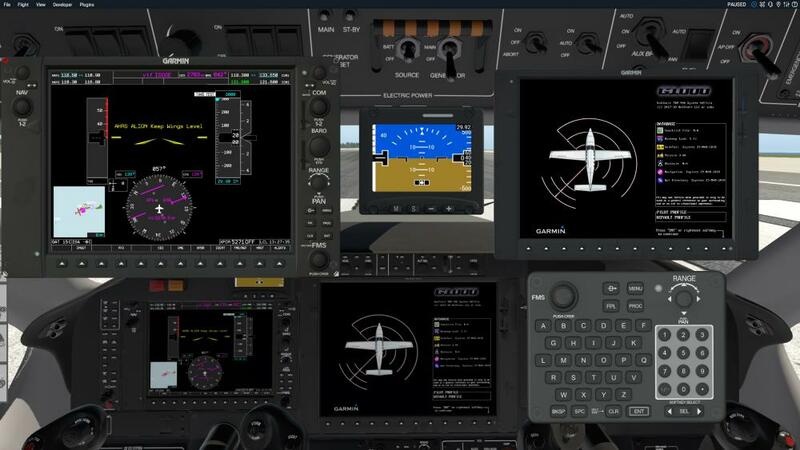 X-Plane 11 G1000 avionics stack with lots of customizations and overlays to simulate the special extensions in the real TBM900. This includes a custom EICAS, systems synoptic pages and special integration with the extra simulated systems such as the weather radar, TAS, electrics, etc. Fully custom electrical system. Simulation of all buses, switching behaviors and reconfigurations. Full circuit breaker system, integrated with the X-Plane failure system, so a failed or failing system can pop a breaker. 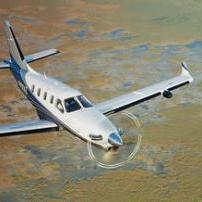 Highly accurate PT6 engine model with realistic startup and operating behavior. Engine lag, secondary fuel flow, ITT evolution, response to auxiliary load and many more fine-grained behaviors. Custom prop governor, with all modes simulated, including electric auto-feather with negative torque sensing. 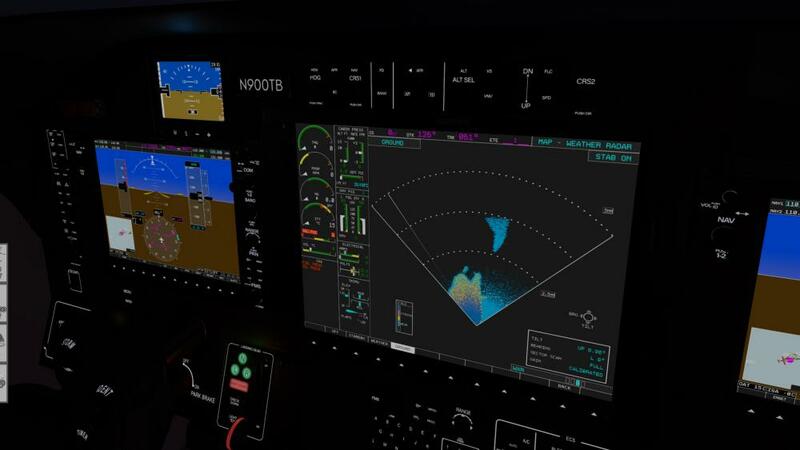 Crew Alerting System integrated into the avionics stack with all annunciations, takeoff/landing inhibits, flight state filters and "corner cases" simulated. Environmental Control System integrated into the custom EICAS. Air conditioning and pressurization respond in real time to environmental factors such as ambient temperature, pressure, available engine bleed air, cabin temperature setting, cabin pressure vessel failures, etc. 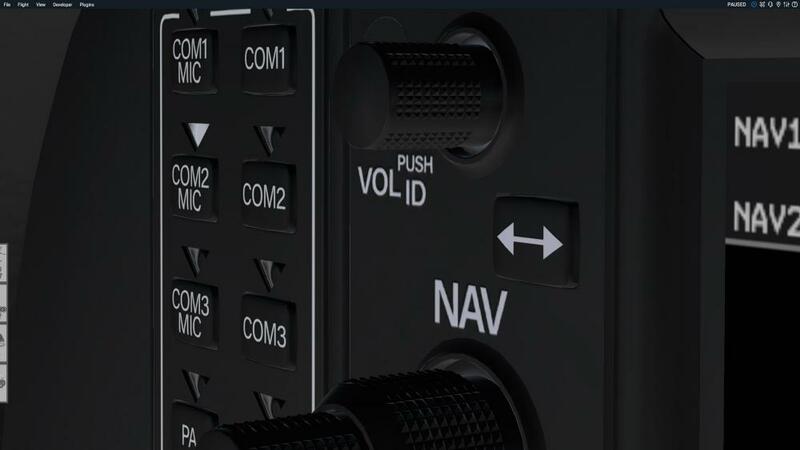 Custom TAWS-B ground proximity warning system with all annunciations modes, inhibits, real-time impact point prediction and terrain painting up on the MFD to ranges of 200NM. The TAWS-B uses the X-Plane terrain DSF data to construct its database, so it is always "up to date". GWX 70 weather radar with weather & ground modes and realistic radar return painting. Full simulation of radar beam energy dissipation, signal attenuation when passing through dense weather and vertical cell analysis modes. Terrain mapping accurately paints surface features, including recognizable peaks, valleys and lakes. Supports the X-Plane 11 default atmospheric model as well as xEnviro. 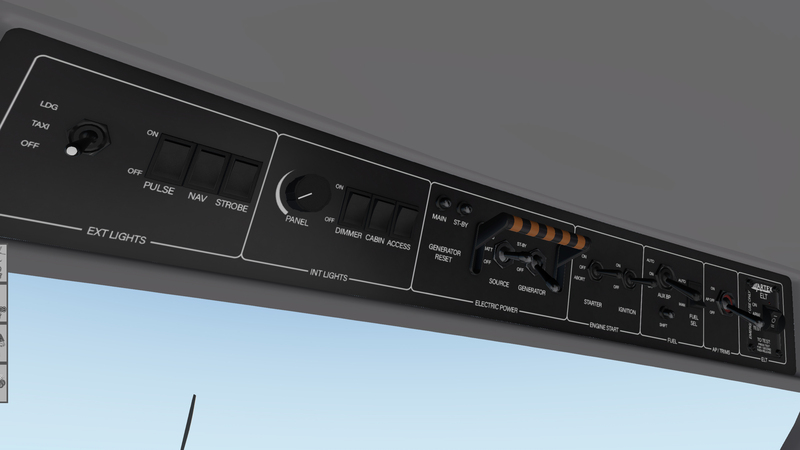 GTS 820 Traffic Advisory System (TAS) with aural alerts + visual alerts, the TAS MFD page and compatibility with X-Plane default traffic, PilotEdge, Vatsim and IVAO. Full simulation of the ESI-2000 standby instrument, including all configuration pages, sensor failures, AHRS drift and "roll-over" during extreme maneuvers, realistic battery operation and real-time battery depletion, etc. Dynamic custom registration mark paiting on the fuselage and instrument panel with support for custom TrueType fonts, colors and positioning. This lets livery painters make a "generic" livery and each pilot apply their own custom registration mark with just the click of a button directly in the simulator. Liveries can specify a custom position and font to optimize the look. Custom sound engine with samples from the real aircraft and accurate modeling of individual engine states and sub-component noises such as fuel pumps, gear pumps, flap actuators, etc. Just to start, we're including some work in progress screenshots below. Remember, work in progress means things are continually being added, both in 3D and programming. 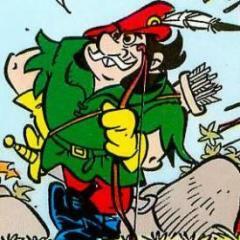 Excellent!!! Can't wait for this release! Amazing work! Day 1 for the system alone. Oh! This will look so nice next to my PC-12. Looking forward to it, great work already! Been seeing this on twitch streams and is my most anticipated plane right now. Good to know a timeframe for release! Looks good, i will follow the Project. Finally a real masterpiece for all GA pilots out there. High and fast... Go Toto go! And nice to see a fine collaboration with Goran. Sounds awesome with persistence wear & tear. 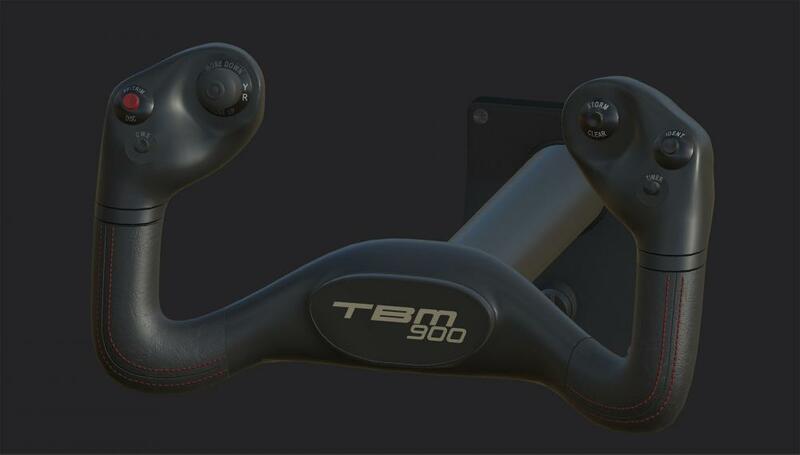 It will be like owning your very own TBM850! Cant wait! Probably gonna be the Best Turboprop in XP just from what I have seen from streams of the Alpha version! Is there a possible release date? Exterior is still being worked on. In it's current state, it's still just an un-textured, work in progress mesh. We'll post screenshots of it when it's finished. Which shouldn't be too much longer. Excellent news. I have been following this along with the sim engine developer Totoritko earlier but now I am even more excited about the 3D models being developed by LES, an outstanding combination. I have been waiting for a serious sport turbo prop single for a long time. Congrats guys and can't wait. Will this be VR compatible? Yes, the plan is for this to be VR compatible on release. Absoultely great to see such a high performance turboprop in X-Plane in maxmimum immersion! Could you please elaborate on the maintenance and wear system? Do you estimate wear and tear (I mean also these microscopic effects like temperature increases or power decrease over time or the temperatures in different parts of the engine) or has this all been recorded on a real aircraft? Very cool indeed! The algorithms for wear estimation are based on a mixture of real world performance data, operational procedures and an approach "from first physical principles" where we don't have exact behavioral data available. 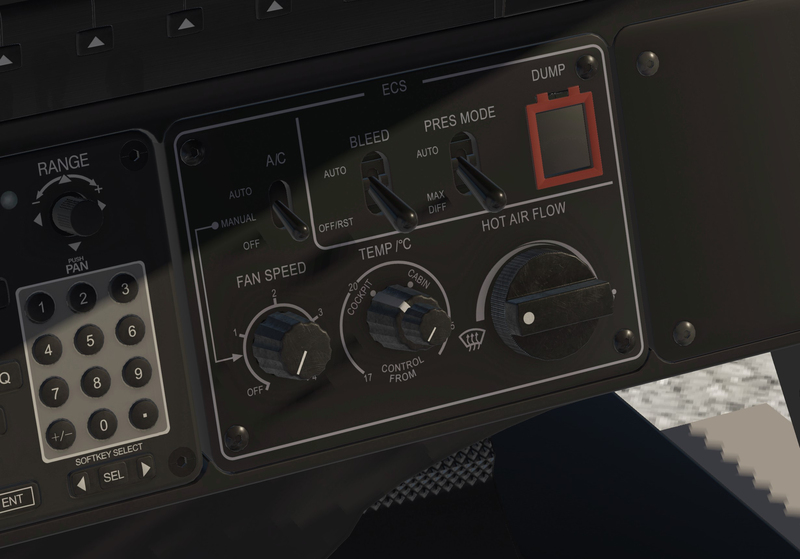 So for example, the engine's ITT behavior is tuned from real ETM data, as is the behavior of the oil temperature at the main oil pump outlet (what you'd see as "oil temperature" in the cockpit). Other parts of engine heating are based on a bit of physical simulation and a healthy dose of hand-tuning to get it to be have sensibly. The "from first principles" approach was used extensively while designing the ECS logic. We know the overall compressor pressure ratio of the PT6 (~14), which the aircraft simulation then feeds as an input to compute adiabatic compression heating of the compressor discharge air. Then we follow that up with energy computations for air heating/cooling and cabin volume pressurization. These are then fed to the simulated air system controller, which takes these sensor inputs and adjusts the various ECS valve positions. 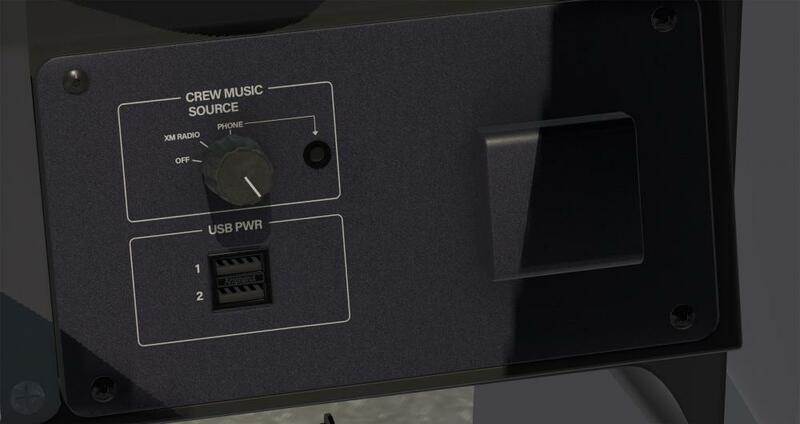 So when you are seeing the valve positions change on the displays, it's not just a simulated bunch of "feel good" animations, it really is the air system controller "fighting" in real time with the physics simulation to try and keep the cabin at a sensible temperature and pressure, much like the controller logic in the real airplane does. However, we make no claims that this is a physics simulation package, nor that all the behaviors are perfectly accurate or that the model is in any way suitable for real world training. Does this mean a crew of 2 (smartco like?). No, this is a different feature. It allows you to synchronize the maintenance state of the aircraft between two computers. The purpose is to enable things like FSE groups to cooperate in the use and maintenance of a single persistent aircraft. 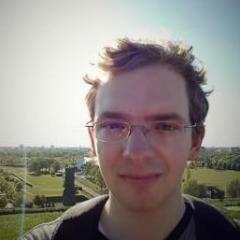 Another possibility is if you own multiple computers with X-Plane installed, you will be able to keep all copies of the aircraft synchronized. Ultimately, the idea is to teach users that even if you're not flying the aircraft, somebody else might be, and therefore when you get it into your hands the next time, you need to perform all the proper checks, tests and watch out for faults that you might not have caused, just like you would in the real world. No more of the "I know it's gonna be fine, because it was fine the last time I flew it". Well, you don't know how the previous pilot treated the aircraft, so you better make sure you take that detail into consideration.